Golden Gate of San Francisco What Should You See? 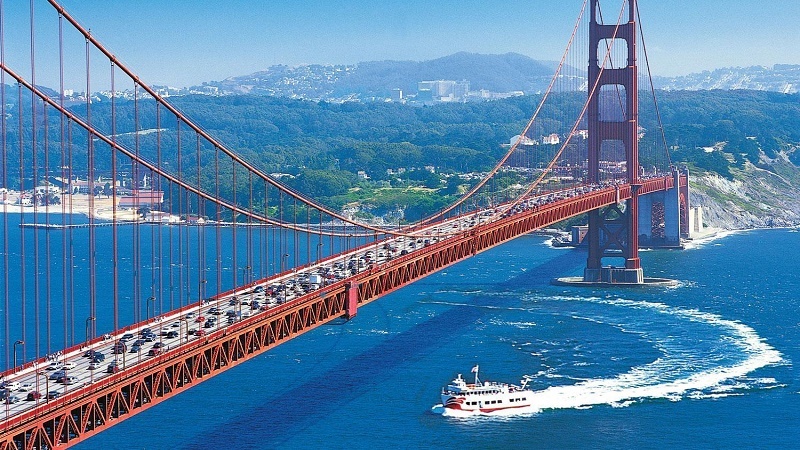 Magazinzoo.com Entertainment,Tour and Travel Golden Gate of San Francisco What Should You See? 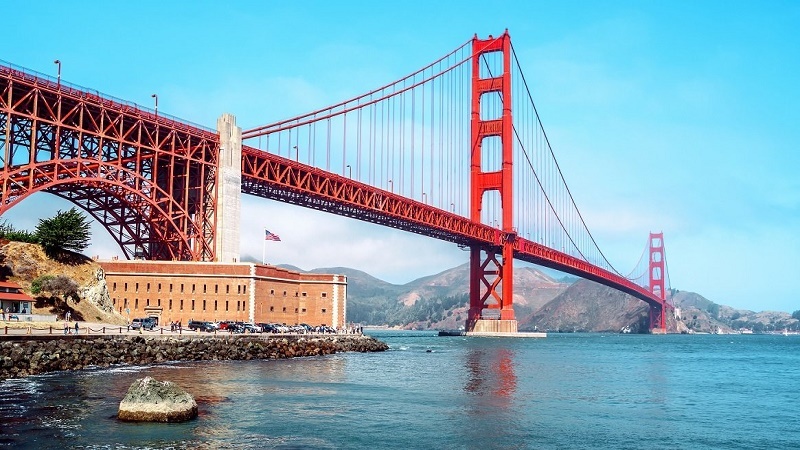 Golden Gate of San Francisco, exposed with an unmistakable architectural beauty. By far it is the largest or longest, but no one doubts that it is the most captivating. The clear symbol that the United States breathed other airs to the rest of the planet 65 years ago. While some emerged with power towards horizons full of hope, the rest watched with admiration as a new world power was born. More than a feat, I would say that it took a miracle so that the great crack depression did not shatter the delirious Wdreams of a few. In fact, and curious as for the crisis of 29, did not affect the city of San Francisco. Where its port was continually used for military purposes. Its construction lasted four years, from 1934 to 1937. The dimension of that time was a challenge for the engineer Joseph Strauss. Bear in mind, that the only way to cross the bay was by ferry. So, the inauguration was not only an architectural achievement but its functionality. With 2.7 kilometers in length, 227 meters in height, 67 meters of suspension and six lanes open to the circulation of vehicles. We speak in theory for the times, of a bridge of normal size, placing the number 198 in the general and in the system of hanging bridges, like the number 12. Many years had to happen to be advanced in a ranking that seems to have no limits if we look at the future projects that humanity is carrying out. Leaving the numbers aside, we have to say that it has been unanimously chosen. The most beautiful suspension bridge in the world. Not only but the beautiful surroundings of the beautiful bay of San Francisco provide the rest that others may lack. Many essentials of San Francisco can be not carried out for lack of time. It ends up being the dream of any traveler. In this article, I am going to tell you what viewpoints you should not miss at Golden Gate of San Francisco. How can you cross Golden Gate of San Francisco? And how to get there? Will you come with me? 7 ARE THERE MORE BRIDGES? 8.1 HOW LONG DO I NEED? 8.2 HOW MUCH DOES IT COST? Coming from San Francisco, it is the first viewpoint there is. Parking, it is not impossible. In fact, I arrived at 4:00 pm and parked free for two hours, although if you see it very fair, there are paid parking, to stay calmer. It is usual to start our route on it since it is the access to the bridge to cross it on foot or by bicycle. The indications are easy and we can provide water since we have a shop, cafeteria, and bathrooms. The interesting thing about this point before making the famous bridge is to visit the batteries. A barracks without previous payment, they have turned it into a curious museum, with rooms set in the time before the bridge existed. That strait was guarded by the army, where they even had missiles for feared invasions. Supplied and prepared, the photographs from the base of the bridge are a classic. Get ready because the slope that goes to the bridge, will be crowded with pedestrians and cyclists, although the dimensions are very respectable, taking a photograph walking alone, is almost impossible. A short path, located at the other end of this side (South), will give us access to a difficult path, which goes to a famous beach, from where to get some good snapshots. We must not miss it. At the other end, in the North, once crossed the bridge on foot or by car, we find, for me, this viewpoint more beautiful than the previous one, although not the best of all. In fact, we did not see the bridge in profile, but the angle is almost frontal. Whoever comes by car, will not have to pay, since the toll is of the entrance and it is a good idea, if we want to leave it for the last. Although devoid of barracks, various tunnels and some explanations carved in metal plates, they will inform us about the history of the soldiers who guarded the city in the past. Here, parking is very complicated, but fortunately, I found the first parking lot. It only remains to wait for people to do the rigorous photography and leave their place free. Arriving is not easy but neither is it impossible. From this viewpoint, the limited parking makes we juggle to stop and shoot our camera. But since we are here, do not cut yourself and keep going up until you finish, being able to see through your window, as the bridge dwarfs before a landscape that, on the contrary, gets bigger, being able to appreciate, how the bridge fits, creating a perfect symbiosis. Undoubtedly and personally, it is the most impressive. Once we are in Vista Point, following the road to Sausalito, there is a detour to the right. There, without people, you can observe it calmly and the beauty can be comparable to that of Marshall on the Southside. Cryssie Fields is the foreword to our arrival at the Golden Gate. At least I was able to enjoy it one day before launching myself to visit it, due to its proximity to the Marina district. Its gigantic beach and a good sunset, are enough inducements so that at least we go to relax, sitting in the sand. Entering the South (Fort Point), walking it is simple, but deceiving. Let’s not forget that it is more than five kilometers to go back and forth, so it is essential to plan the time it will take to do so. I made three quarters and went back to take the vehicle again and go to the North side, to go later to Sausalito. There are two roads, one for pedestrians and another for bicycles. Just before entering, the directions will tell you which way to go. Worth? A resounding yes. Of course, the memory that we keep in the retina is from the distance, where everything is exposed, but once you are on top, you realize the feat and magnitude of the project that took place 80 years ago. Being a person who suffers from vertigo, there were some moments in which I had to look out to see the whales that went under, and that’s where I really had a hard time. I suppose that the rest should give him a lot of security, although I’m sure that under the mantle of cold water that locks the bay, hundreds of slippery mobiles should rest. Whether on foot or by bicycle, it is mandatory to cross it. Yes, and a very important something like the Golden Gate. We are talking about the Oakland Bay Bridge, less known, although much larger and longer. Its use to the traffic is very efficient and crossing it by car is highly recommended, since the visit on foot is not worth having the Jewel of the Crown a few kilometers away. HOW TO REACH GOLDEN GATE? Public transport, maybe a little bit when we talk about getting to the base of the bridge. The buses that we must take are the 28 or the 76 that will leave us in the South parking area. It may seem like a good idea, but the frequency of these is not adequate, and you can wait up to 40 minutes. Undoubtedly is a good method to get to it, but I’m not one of those who take these means, preferring to tour the cities at my own pace, discovering the two faces that a place can show you. If you are regulars to these transports, well you have it easy although you will not exploit the area as it should. An ecological and healthy environment, which is becoming a classic for the Golden Gate. You must carry water in abundance and try to dose forces. The famous route to Sausalito is hard and reaching the most important viewpoints is almost impossible. Only some will be at your disposal. You should also bear in mind that one direction of the bridge is pedestrian and another for bicycles. The best way to do it for my taste although many people disagree. I did it in a rented vehicle and went with many doubts, if I was going to find parking or how I would do it so as not to get lost. It was a resounding success, being able to squeeze every possible angle and throw myself up the hill where the great Golden Gate is dwarfed offering incredible views. For me, it was a success even being Saturday the day I decided to visit it. I started at four in the afternoon and finished at eight. With those four hours, visit both ends and cross the bridge on foot. Once Sausalito was done, I set out to climb the mountain to finally find one of the most beautiful viewpoints. If you go on foot or by bicycle, there is no ticket to pay. To get into San Francisco by car and cross it, you must pay $ 5 dollars admitted with a credit card. However, leaving the bridge to the outskirts is completely free. It was the only toll I paid (with pleasure), in the 7,000 kilometers of road that I made during my great route. Take warm clothes. The microclimate of San Francisco is something crazy. Those who have a disease, you are warned that at certain points, can cause destruction. Stay tuned from the heights of the suspension bridge. We spotted four huge whales just below. Oh, above all and it is the most important advice, enjoy it!